Is it possible to unblend a blend? Megan was our cupping leader on Thursday and she decided it would be great to do a cupping of all the coffees that comprise one of Tazza D’Oro’s popular blends. A coffee blend is comprised of precise percentages of different single origin coffees. And a single origin is a coffee that comes from a specific growing region like Ethiopia Harar is from the mountainous Harar region. A single origin coffee has specific characteristics as do wines. Small differences in the coffee’s growing climate, altitude and processing can produce very different flavor profiles. Our roaster takes careful consideration of all these aspects, carefully selects high quality green coffee and then roasts the beans to coax out the coffee’s unique regional characteristics. Blends tend to be more complex than single origins because of the many different levels of roast, body, acidity, aroma and flavors each coffee contributes to the blend. Great coffee blends are an art and craft of complexity and of the palate. The basic premise behind blending coffees is to produce a well-balanced, consistent cup with a distinctive flavor profile. The roaster must to able to bring different coffees together by understanding the coffee’s distinctive characteristics and precisely chose complementary flavors to produce a superior cup. Sounds like cooking, doesn’t it? Bohemian Blend is a customer favorite. This blend is a “big” cup of coffee. It is comprised of an Italian roast, Sumatra Mandheling, and Costa Rica Tarrazu. The Italian roast is a dark roast coffee that contributes a spicy acidity and smoky flavors. The Sumatra Mandheling is another full-bodied coffee, with a floral aroma, and earthy flavors. The Costa Rica Tarrazu, a medium full-bodied coffee, adds a citrusy acidity and flavors of sweet fruits and nuts. Megan lead the group through all the cupping exercises with each individual coffee then she added a second set of cups for a blind tasting. The challenge – which coffee was the Italian roast, Sumatra, Costa Rica and Bohemian Blend? The staff and customers did really well but had some difficulty differentiating between the Costa Rica and Bohemian Blend. The entire group commented on the similarity of the acidity and sweetness of both coffees. Thanks, Megen. 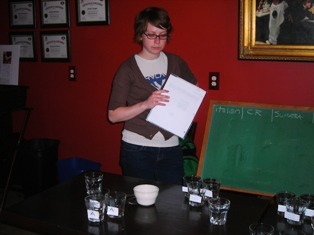 Our coffee cuppings are held every Thursday beginning at 4:30 pm. If you can’t make it, from 5:30 p to 6:30 p one of our baristas will be happy to make you samples of coffee and provide you with all our cupping information.